The position of Controller is a high-pressure, high-responsibility, and high-paying position most small business can’t afford. Good Controllers are in demand. So even if you’ve grown to be a medium-sized businesses, it may be hard to find the right individual for the role. 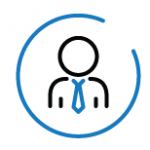 When you outsource to SoPro, we provide a Controller who works with accountants to provide all the expertise of a full-service, in-house accounting department—at lower cost. A SoPro Controller is your most senior accountant, focusing on financial results. During our client onboarding process, s/he will specify a well-structured month-end-close and controls. Then our accountants will thoroughly complete such procedures and close your books on time, earning your trust in our reporting cycle. Your data is then reviewed by this Controller, who’ll make any necessary adjustments to ensure your accounts are GAAP compliant.